I’m sure if only President Trump had kept America in the Paris Climate Accord Hurricane Harvey would have blown back out to sea or not been as severe. That’s just about how the climatistas are predictably reacting to the flooding and devastation in Houston. The flood disaster unfolding in Houston is certainly very unusual. But so are other natural weather disasters, which have always occurred and always will occur. . . There have been many flood disasters in the Houston area, even dating to the mid-1800s when the population was very low. 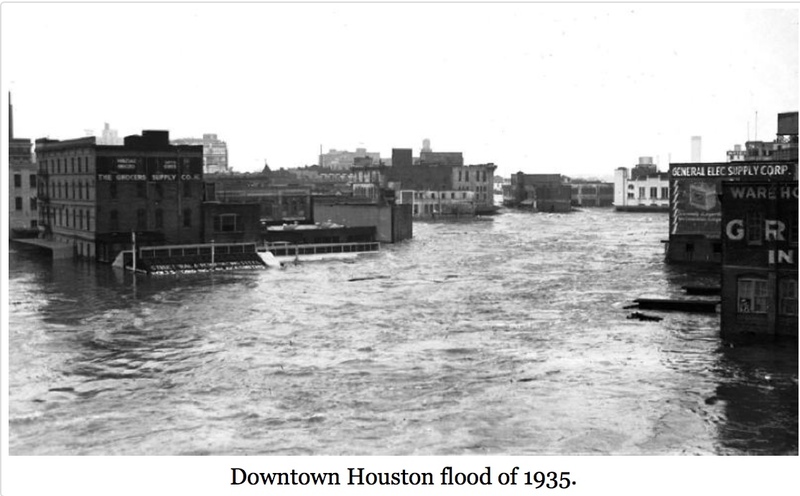 In December of 1935 a massive flood occurred in the downtown area as the water level height measured at Buffalo Bayou in Houston topped out at 54.4 feet. By way of comparison, as of 6:30 a.m. this (Monday) morning, the water level in the same location is at 38 feet, which is still 16 feet lower than in 1935. I’m sure that will continue to rise.